Welcome to SEOToolsCentre's article rewriter which is used to rewrite or rephrase your articles, essay, and assignments. It is very useful for professional writers, scholars and students. This English rewriting tool works very quickly and carefully. Is this necessary to use article rewriting tools? No! It is not necessary to use a rewriting tool. It is designed for people with poor English to fulfill their needs. If you are a professional content writer, then it’s also useful for you. It will enable you to increase your vocabulary and synonyms memory. Recently, we have added up to 500,000 synonyms in this tool for english language and it will enable you to create content with more professionally. How does this article reworder tool works? SEO tools Centre rewording tool scans your content and suggests you the alternate words for your existing words. The suggested words will be highlighted in the bold and colorful text. You can also replace the suggested word with your own or other suggested words or revert it to original words. How to use the SEO Tools Centre to produce quality contents? Recently, we have upgraded our content rewriting tool and added up to 500000 fresh synonyms to this tool and it will enhance the value of the rephrase tool to its peak. The purpose of improving this tool is to provide better words or phrased to meet up the requirements of the universities or Google content policies. 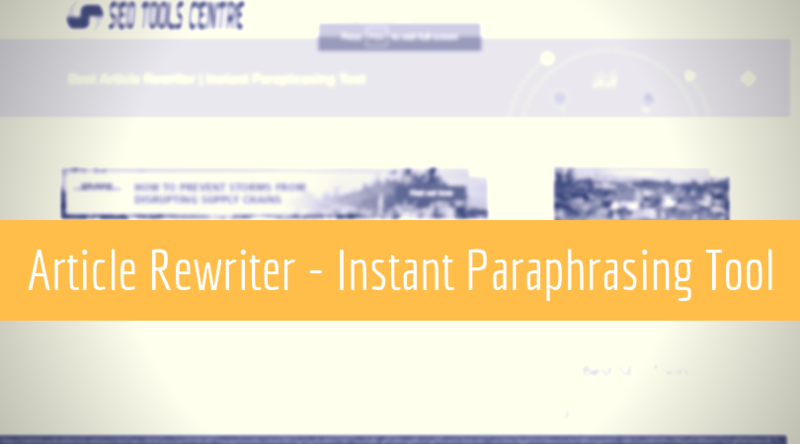 It can be used as article spinning tool to create the new version of an article to pass the plagiarism test. However, it called double edge sword and always use it at your own risk. We have prepared few tips for you if want to use article rephrase tool for SEO purpose. Always start with quality content: Quality content means is unique content on a very specific topic. You have to create unique valuable content which will be more informative for human readers. It’s impossible for a program to produce content that is engaging the users because it just replaces few words without any writing skill. So, It’s a big risk for you if you start with low-quality content and the more risk if you are going to use the alternate version of the articles. Read before replacing the suggestions: Before applying the suggested words you must have to read all the suggested words and always use the words which match with the context or revert unmatched words to the original. So, If you feel it doesn’t fit into the reading. Click to “rewrite again” for the new version of your favorite article. Check for plagiarism: We recommend you to verify your generated content for duplicate content issue when you become satisfied. Another, before starting the plagiarism test you must have to analyze it for grammar errors using the grammar checker tool. After fixing the grammar error must analyze it for duplicate issues using plagiarism checker for. We never suggest or recommend: To use this tool to produce multiple versions of the same article to publish spam. Publishing spam can be a reason to be penalized by Google. It's also zero value to your targeted audience. Note: If you want to paraphrase your article for multiple pages then the try "online paraphrase tool" to rephrase your content more professionally. We recommend you to always analyze web content uniqueness using "Online Plagiarism checker" if you don't want to be plagiarized.